Food is the highlight of any occasion. It’s how we plan our days (and evenings). It’s how we map out our trips to the grocery stores. And it’s what we highlight during any event planning process. When the time comes to figure out the food for your special event — whether it’s a birthday party, retirement celebration, graduation fiesta, or just about any other shindig imaginable — you only have but a few options. You can cook all of the food yourself, which requires a whole lot of planning, trips to the grocery store(s), and exhausting hours in the kitchen. If cooking isn’t quite your thing, then you can also consider hosting a potluck-style event — though somehow it seems those types of parties always end up with too many bags of chips, tubs of potato salads, store-brand cookies, and not a single main dish. Or, you can avoid all of these hassles and headaches with special events catering from your local catering company. Why should you hire Etai’s for your special events catering in Denver? It’s simple — our wide-ranging menu features dozens of delicious, fresh items that are made by hand at our Denver kitchen. We offer fresh, healthy choices for people with all types of taste buds. Not to mention, we will take the food planning and preparations off your hands so that you can focus on the other aspects of running your event. Finally, we provide high-quality, always-fresh local eats that do not break the bank. So, what types of special events can be catered? Stay tuned to read just a few, and contact Etai’s Catering in Denver to place your order today. Are you hosting a corporate meeting or event? For those hard-working business professionals who are always on-the-go, special events catering provides a valuable source of nourishment. The guests at your business lunch will benefit greatly from the grab-and-go catered box lunch options, which come prepared with a fresh, delicious, legendary Etai’s sandwich, a bag of chips, fresh-baked dessert, and more. Whether it’s your son’s 10th birthday celebration or your mom’s 75th, one thing that every guest expects in exchange for their presence (and their presents) is to be fed. Take some of the stress out of planning a birthday party by hiring our Denver catering services. We do everything from box lunches, to meat and cheese platters, to fresh-baked desserts. Chances are, nobody is going to remember the tablecloths or your first dance song. But one thing that every wedding guest will remember for years to come is the food spread. Make it a memorable one with special events catering that features everything that a guest could want — fresh baked bread, delicious desserts, charismatic cheese platters, and coffee to top it all off. What’s a better way to loosen up people’s wallets and compel them to give than by providing them with a nice, full tummy? We can’t think of one. Consider our special events catering in Denver and host a fundraising event that will be the talk of the town. 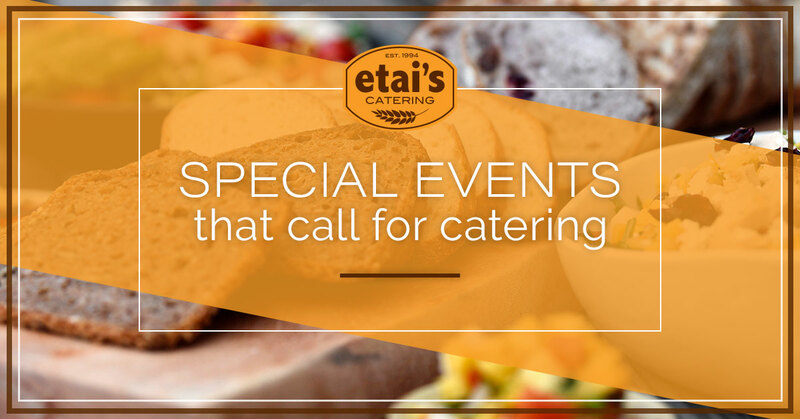 Want to order Etai’s Catering for your next event? Now it’s easier than ever before! Place a special events catering order online today.